For our skyscraper, we chose a section from the side of the mesh and crack form to produce. This command is a basic command to tell whether a specified point is within a closed geometry. Within the commands, the variable location of the point leads to a simple true or false reaction as to the point being inside or outside of the geometry. The ZA11 pavilion in Cluj, Romania, combines public sculpture with a functional space for small gatherings through parametric design to give a hexagonal pattern to a screen and sculpture that fulfills a need to be both striking and functional. 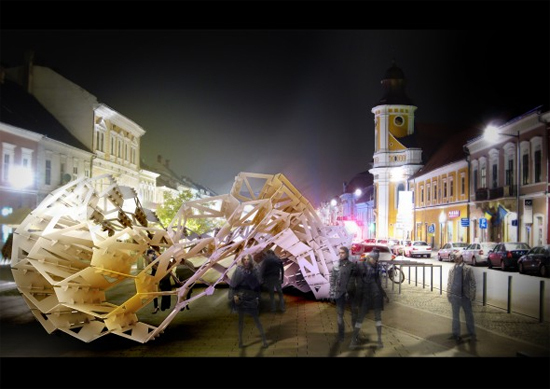 The project exists as an attraction to passersby to entice them to attend events for the local architecture festival. 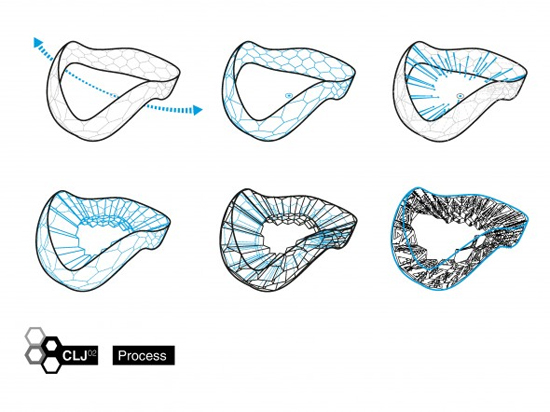 The project was led by a group of students that looked to use parametric design to create a variable ring with deep hexagonal openings and an exact geometry for its 746 unique pieces. Its undulating form promotes a circulation through and a visual spontaneity that is intriguing, in order to promote visual interest outside and a flexible, human -scale space for gathering inside. In relation to a skyscraper, the variability of the exterior depth and construction of the form in the pavilion is an example of how the exterior of a skyscraper can also create and define spaces by opacity and geometry. The entrances and circulation are integrated into the geometry of the form and redefine the thresholds of a space, incorporating them into a single thematic form that rises and falls with the whole.